Highlight: MJO Progression Needed To Push Cold into East. Discussion: Last year snow cover was in retreat across the West while advancing in the East. The opposite is true of 2019. 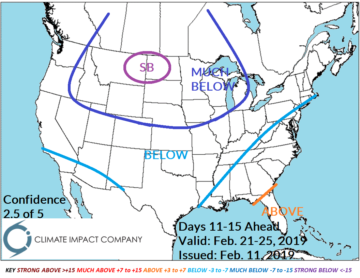 Snow cover continues to advance in the West helping to sustain a potentially record cold February. Meanwhile the East is biased warmer unless snow cover can expand. Discussion: The super cold eases slightly West/Central days 6-10 but remains impressive. The cold advances east to the Appalachian Spine. 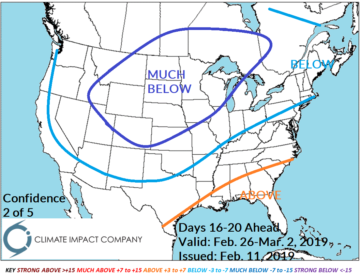 In the 11-15 day forecast a progressive MJO should shift the core of the cold out of the West and possibly into the East. If the MJO is not progressive the East will be warmer. 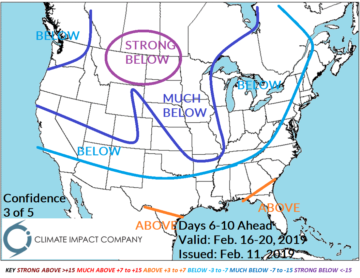 Discussion: The cold pattern remains and centered over the Great Plains. The only warmth is in the Gulf region. Discussion: Expanding snow cover in the East is needed to allow western cold to shift eastward. 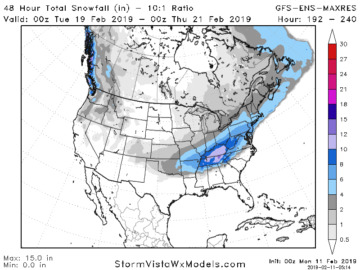 Both operational models indicate a big snow storm in the Tennessee Valley Feb. 19-20.